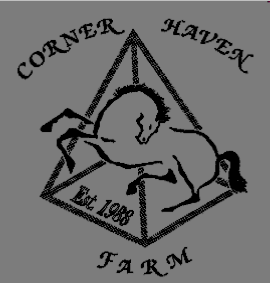 Corner Haven Farm was started in 1988 by Michelle DeBell (formerly Barnes, nee White) at the age of only 27. Michelle was class of '83 at Cornell University in Animal Science. She grew up riding every horse she could get her hands on in many disciplines including western, english, gymkhana, competitive and endurance trail riding. After college she was barn manager for 3 years at a local stable specializing in hunter/jumpers and became hooked on jumping! 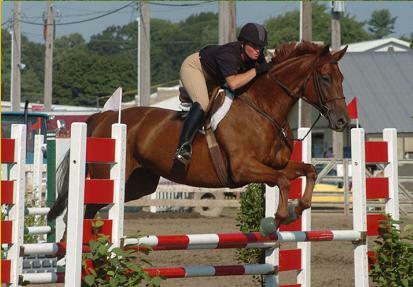 Her show success includes many years and wins on the A-show circuit in hunters and jumpers. She has ridden with many top trainers in a variety of disciplines and attended many clinics with top trainers and past Olympic riders. The addition of husband Dan DeBell in 2000 effectively doubled the work force! Many new construction projects ensued including a new indoor ring and many new paddocks. Dan also is responsible for all the beautiful pine tongue and groove finish work and lots of fun jumps for the rings. He also gets to be the head maintenance man in addition to his full time job! Her training program has produced many show winners and talented riders. These results are the product of hard work, time and a little trial and error! The main teaching and training methods are simple: repetition and consistency. There are no short cuts on the road to success! CHF specializes in producing riders and horses that can go from the show ring to hunterpaces with confidence, competence, good sportsmanship and most of all FUN!! The atmosphere is casual, clean, safe, and friendly. CHF strives to make horsemanship a priority and offers high quality services, instruction and sales at reasonable prices. Opportunities for working students and volunteers are available to those who are truly "horse crazy"!